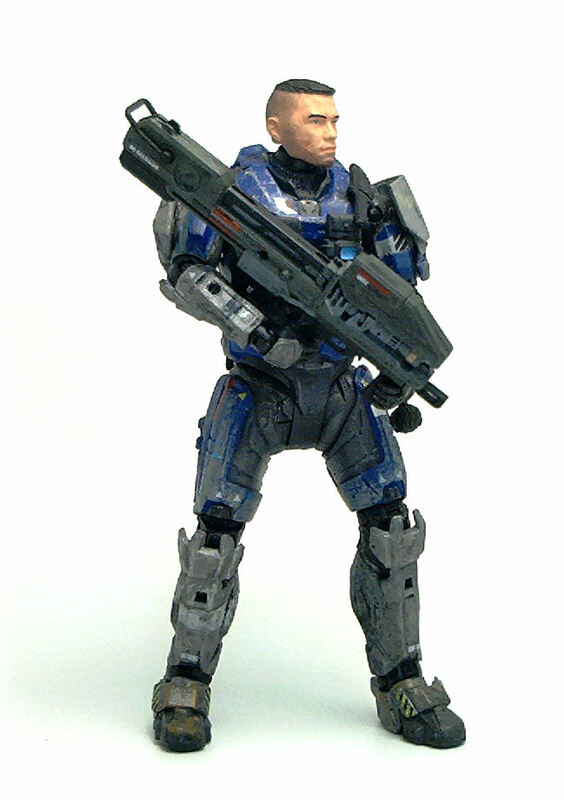 Well, after five series of action figures based on the Halo: Reach license, there is only so much you can do to keep things interesting, especially when the line relies in reusing only three or four basic body molds for everything. 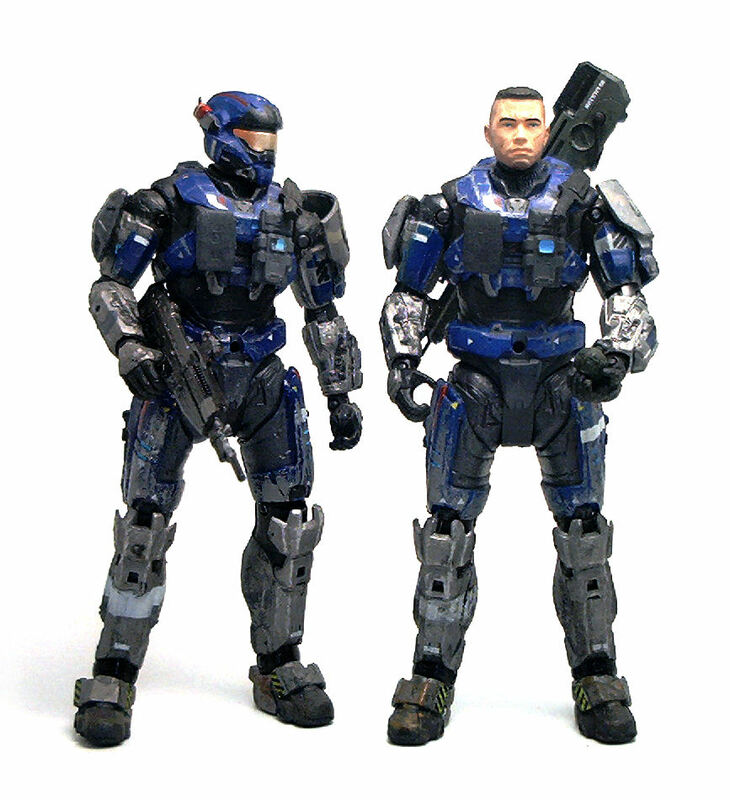 McFarlane Toys went for re-releasing the members of Noble Team without their helmets, which does make some sense because in the cut-scenes from the game they are often shown that way. The first Noble that got this treatment was Jorge in Series 4, but the subject of today’s review is his CO, Lt. Carter from Series 5. 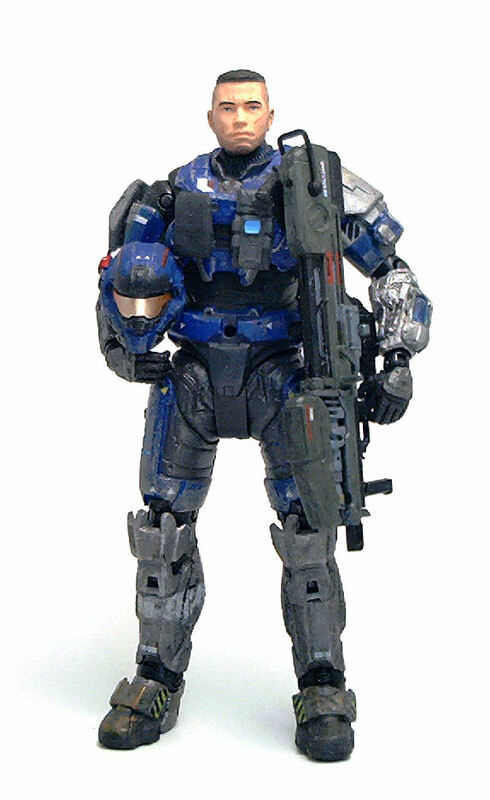 Carter uses the standard Spartan body, customized with the same shoulder pads and utility packs from the Series 2 release. 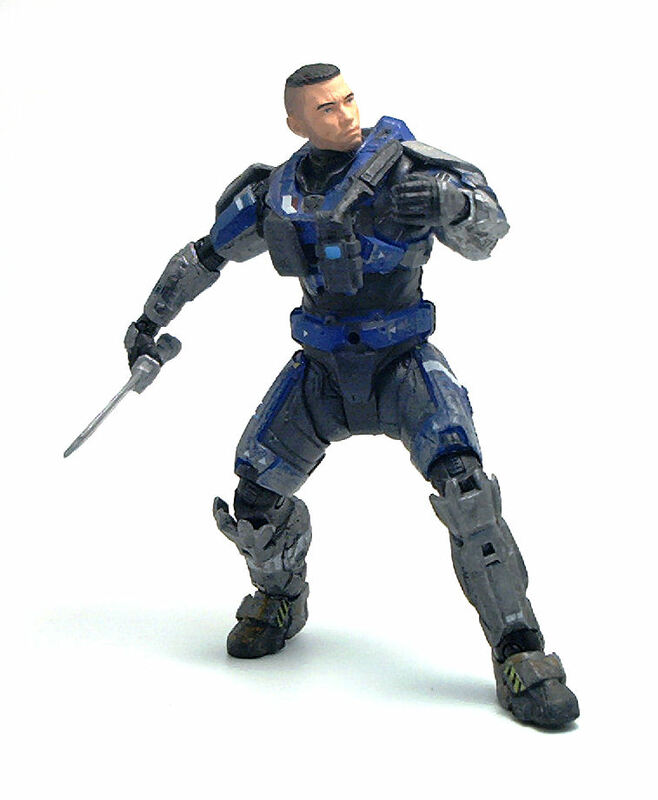 However, while this version of Carter incorporates some improvements that were introduced back in Series 4, allowing the knees to bend more, it still has the same issues the original version had regarding the ease with which the shoulder pads fall off once the figure is out of the package. This isn’t a fatal issue by any means, but it is something that remains just as annoying. The only new piece on Carter is the head, which clearly showcases McFarlane Toys’ skill to produce realistic, lifelike sculptures. The likeness to the digital model portrayed in the package is a bit off though, but even so, the face is so full of personality that it hardly matters. Carter has a number of scars sculpted all over his face that kind of add to his rough good looks. The paintjob is really where Carter shines, but not necessarily that on the body, which is painted well, but on the head. Carter has a fair skin tone and very short hair, so the top of his head is painted simply in dark brown, but from the back of the head towards the sides, a subtle gradient was applied to simulate increasingly shorter hairs that eventually become beard stubble. The facial scars are also painted neatly with a rosier skin tone that is slightly darker than the color of his lips, and the eyes were given the full three-color approach with black pupils and eyelashes, white sclera and blue irises, all painted under solid black eyebrows. The part where McFarlane played it smart was the accessory selection. 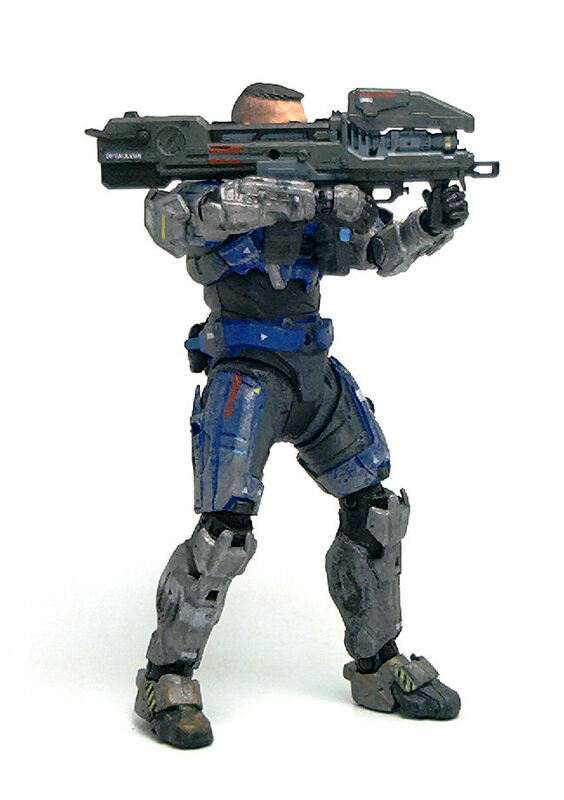 While they did include one regular fragmentation grenade (which Carter can’t carry on himself because his grenade pegs are used up by a supplies pack), instead of just issuing the same battle rifle from the original release, they opted to give us a completely new weapon, the Spartan Laser. This heavy weapon has one removable peg to attach to Carter’s back and no moving parts, except for a plastic loop at the buttstock which I guess is intended for a carrying strap. 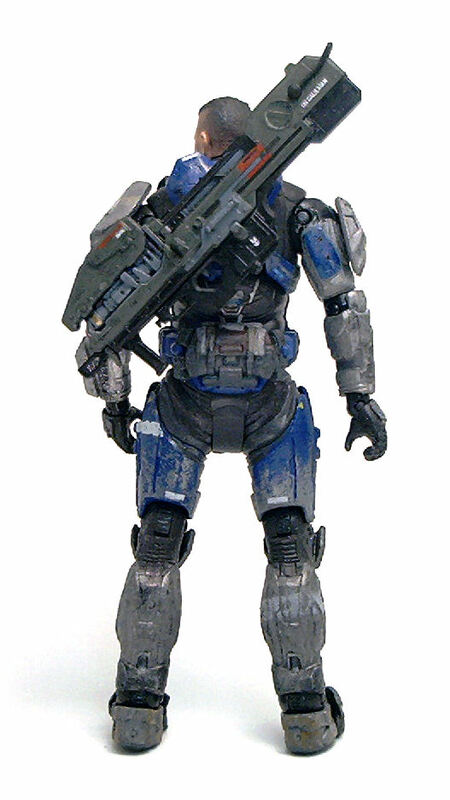 The Spartan laser has a two handles, one for the trigger and the other for support and is painted in army green, gray and silver, with a variety of warning signs, UNSC crests and the word “Gallillean” stenciled on. Overall a pretty decent action figure, although, probably not an indispensable one. You’ll see, after around fifteen or so Spartans in my collection, a newly sculpted, unarmored head and a previously unavailable weapon didn’t really excite me that much, but after a few months and a 40% price drop, this version of Carter started to look like a good deal and once I got him out of the package, I started thinking that I may not have regretted getting him sooner, after all.